Between the desert plains of Karesia and the icy wastes of Ranen, there once lay the kingdom of Ro. Its lands were fertile. Its men and women were prosperous. Their god – the One – was satisfied. But then the men of Ro grew unwatchful, and the armies of the south took their chance. Now the Seven Sisters rule the Kingdom, enslaving their people with sorcery of pleasure and blood. Soon, they will appoint a new god. 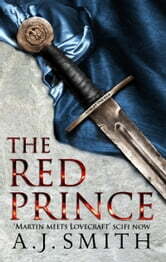 The Long War rumbles on ... but the Red Prince has yet to enter the field of battle. ALL THAT WAS DEAD WILL RISE. Love his books and this world is growing deeper and deeper with each book. Do yourself a favour read thr first book you will be hooked i promise.